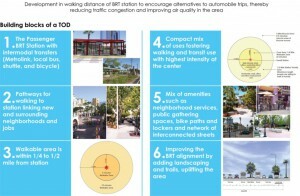 TOD refers to a compact, mixed-use, pedestrian-oriented neighborhood or district surrounding a transit station. TODs often feature a variety of residential types combined with retail, employment centers, public areas, and other services. TODs typically have a radius of one-quarter to one-half mile (which represents pedestrian scale distances) with a rail or bus station as the center. 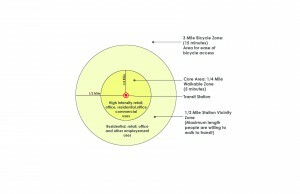 The center of the TOD is surrounded by relatively high-intensity development, with intensity of development gradually reducing outwards to be compatible with non-transit-oriented uses. A TOD area is convenient for employees and residents to travel to the transit station by foot, bicycle, transit, and accommodates vehicles. 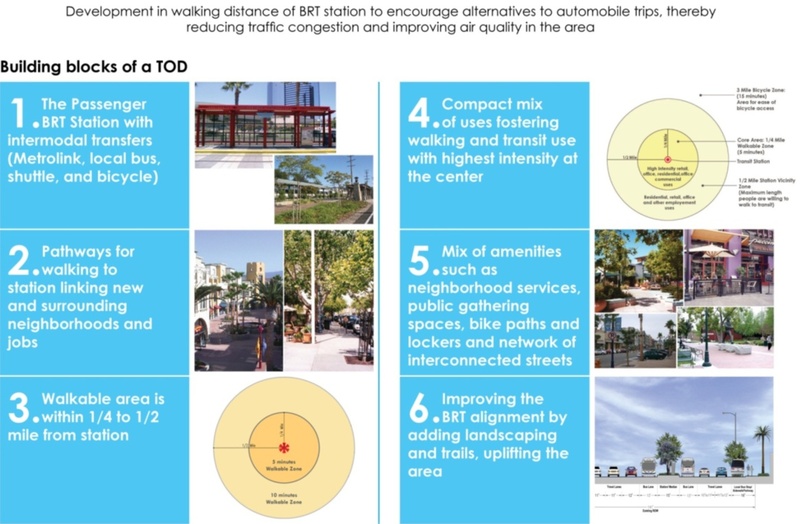 An attractive, functional and accessible transit station with pedestrian and transit amenities as the focus for the TOD area, as shown in Figure 18-4. 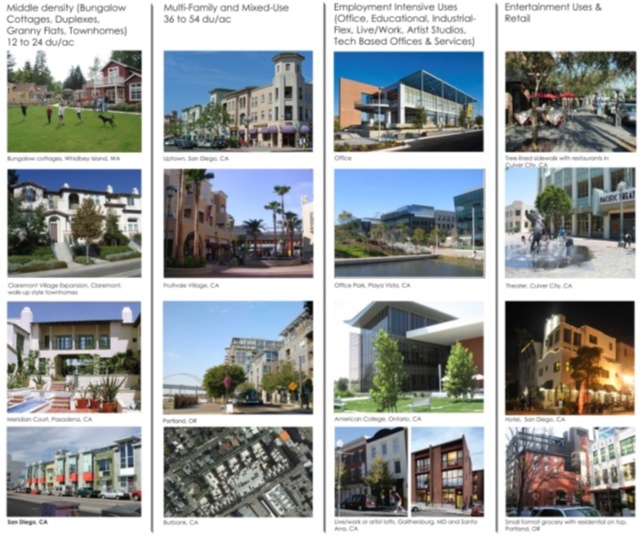 An appropriate mix of uses such as office and other employment, retail, entertainment, residential, office, and recreational facilities that foster transit usage, walking to the station, and opportunities for people to work, shop, live and play in the area. Decorative crosswalks create pedestrian awareness and caution drivers entering a pedestrian area. Inviting public and civic spaces near stations. Building entrances oriented toward the street with parking behind buildings or underground. Well-designed and managed parking such as public parking structures, shared parking between uses, appropriate parking requirements, and bike parking facilities to reduce the land devoted to parking. Pedestrian connections such as sidewalks, pedestrian paths, and private paseos leading to the station and between uses. A bicycle network consisting of bike paths or designated bike lanes, connecting the transit station with other transit stops, the surrounding area, and citywide network. 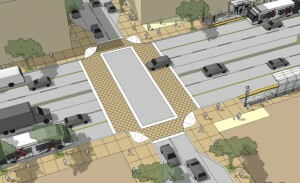 An interconnected network of streets where walkways, landscaping, and pedestrian/bicycle amenities receive priority. Adequate sidewalk widths for at least two or more people to walk side by side. Street trees at the curb in parkways or tree wells, in combination with drought-tolerant landscape and water retention and filtration areas. A row of parked cars on the street to provide a buffer between the pedestrians and moving traffic. Traffic calming by providing curb nubs to reduce pedestrian crossing distances. Pedestrian-oriented signage and pedestrian-scaled lighting. For More Information please see Section 18 of the Transit Design Guidelines.